1. There will be an Artistic Advisory Board meeting (open to all interested parties) on Sunday, November 3rd, 2013 at Sandy Goad's house (2638 North Jade Avenue). It will start at 5 PM and will include a "potluck", so bring your best dish (or for you non-chef types, the chips & salsa!). We will discuss the shows that have been submitted for the 2014 season. All potential directors for 2014 should attend (or, if not possible, have someone knowlegable in their show attend for them). Again, the date/time/location is Sunday, 11/3/13 at 5 PM, 2638 North Jade Avenue. 2. The haunted house is going strong and has two more chances to scare you to pieces! Thursday and Friday (10/31 and 11/1) starting at 7:30 PM, prepare to launch for distant worlds in "Alien Assault", and brace yourselves for another trip to pirate isle in "Marooned on Pirate Isle". It's a double feature, two haunts and twice the scares for the price of $10! 3. 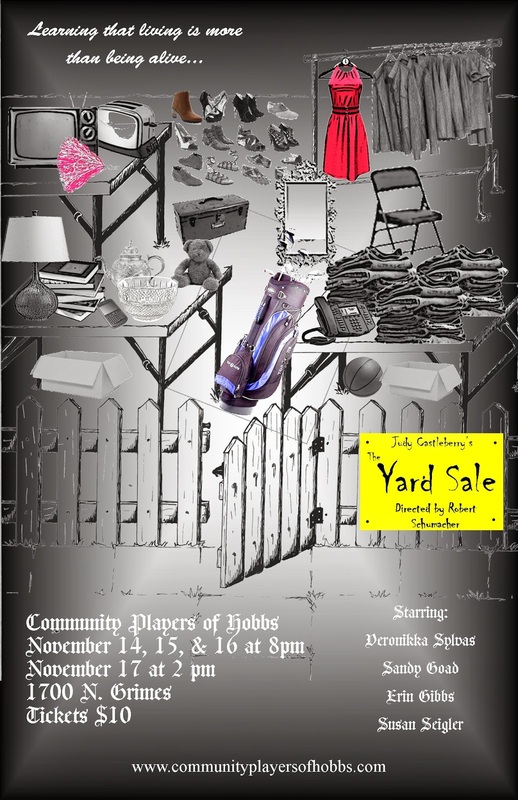 Tickets are on sale for "The Yard Sale", a one-act comedy by New Mexico playwright Judy Castleberry, directed by Robert Schumacher. 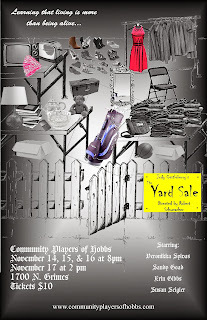 "The Yard Sale" stars Veronikka Sylvas, Sandy Goad, Erin Miller-Gibbs, and Susan Seigler, and follows "Mona" as she visits an odd yard sale run by three quirky sisters. "Mona" learns that living is more than being alive in this life-affirming comedy. Tickets are $10 and can be purchased at our website (http://www.communityplayersofhobbs.com). Show dates are November 14th, 15th, 16th (8 PM), 17 (2 PM). 4. Our fellow theatre at New Mexico Junior College will present "The Glass Menagerie", directed by veteran Playhouse director Nathan R. Miles (Professor of Theatre at NMJC). This Tennessee Williams classic stars Mari Vigil as Laura Wingfield, Miles Wiseman as Tom Wingfield, Eric Taylor as Jim O’Connor, and features Kristen Hester as Amanda Wingfield. Show dates are November 21st, 22nd, 23rd (all shows 8 PM). Tickets can be purchased online (https://buy.ticketstothecity.com/purchase.php?event_id=2685) or at the door.